More and more people are creating outdoor rooms to enjoy their yards. Adding a piece of garden art or a decorative container can create a focal point, add the finishing touch, or just delight the eye. Over the course of the growing season the garden changes dramatically. From the fading of spring bulbs to the end of daylily season, holes develop in various places in your garden. These holes can be downplayed, disguised or complemented easily with the addition of a piece of ‘garden art’. 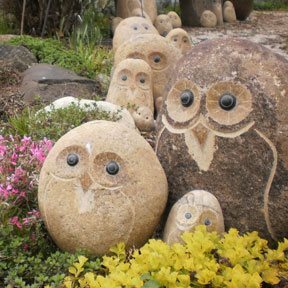 Garden art can be anything from a handcrafted sculpture or a gazing ball to a trellis or an interesting collectable piece. Even a mirror can add depth and brightness to a dark corner. Let your creative juices flow. Why not disguise those fading bulbs with a temporarily placed bench? It can later be moved to complement a summer blossoming perennial or hide an empty spot left after flowers have been cut back for the season. Gazing balls, brightly colored toadstools, a pedestal holding a special item could also fill those spaces. The choices are endless. Place a piece with complementary colors near a plant in full bloom to add even more sparkle to its display. Another fun way to add some sparkle is with lights. These days there are plenty of battery operated lights or fun outdoor options for the outdoors. Light up a little scene inside a lantern for a hint of magic or string lights or hang an outdoor chandelier from a tree branch. Containers can also offer an easy, colorful way to fill a gap, distract the eye, or create a splash. The colors of the container and plants can provide the perfect focal point. You could even use a tall, narrow container as an artistic addition without adding any plants. Garden accents can also enclose an area by building a temporary wall with a trellis that can be simply pushed into the ground or staked. Trellises that connect can create a longer wall. Annual or perennial vines will add spectacular blooms. Garden art can also be functional. Evergreens and tidy mulch beds can be great backdrops for an accent that will add interest without the extra work. A birdbath is a great choice near the evergreens, as they will provide quick cover for birds. Plants that appeal to hummingbirds will look even better with a hummingbird feeder nearby. You might be saying to yourself, some of these things like pedestals and containers sound heavy. An essential piece of equipment for any creative gardener is a hand-truck. With that simple tool a gardener will be empowered to haul just about anything anywhere at any time! Each garden has its own personality that can be embellished and fine-tuned with the addition of garden accents. 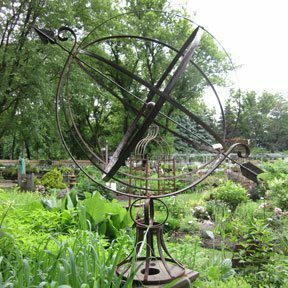 The Growing Place offers a large selection of garden art including benches, statuary, containers, trellises and more. 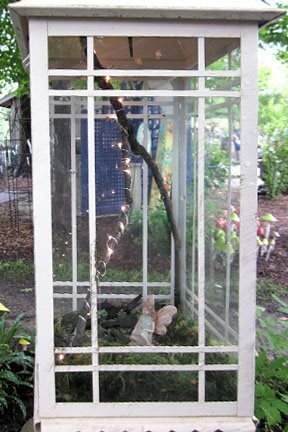 You can also find some wonderful, unique pieces at our Gardener's Art Festival this Saturday, June 20!